While this personnel is facing a dilemma at a mission with an event on it, he may gain a skill from a personnel in your discard pile until the end of the mission attempt. You may do this only once each turn. "I honor the sacred land of the Sky Spirits." 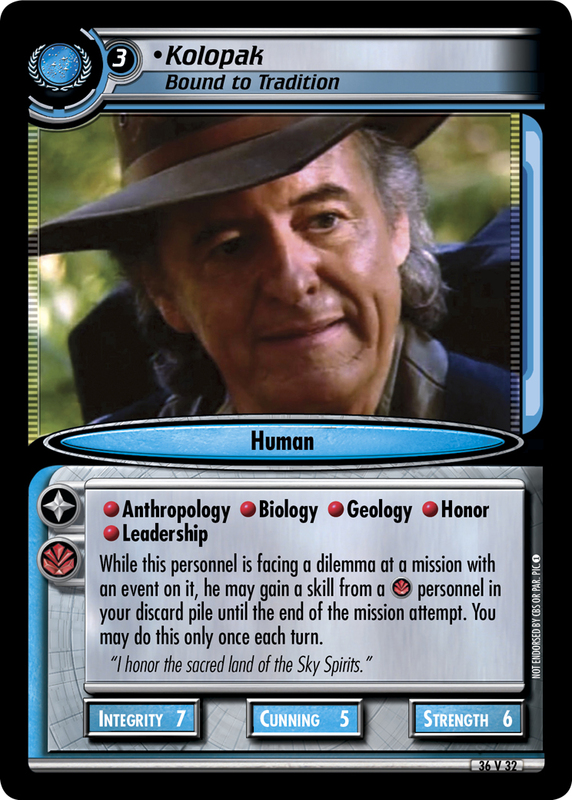 Characteristics: event related card, affiliation, "use" your discard pile, Maquis related, enhance your skills (this card), personnel who has a cost of 3 or more, Human species. Requires: Maquis related, plays / place on a mission. Card logging info: First edited by Telak at Apr 23rd, 2016. Please support openCards and validate game text of this card!